Lieutenant Colonel John Alexander McCrae M.D., (30.11.72 - 28.1.18) - a surgeon in the Canadian artillery, managed a field hospital tending chlorine gas victims during the 2nd. Battle of Ypres. A close friend and former student, Lieutenant Alexis Helmer, was violently killed in this conflict. 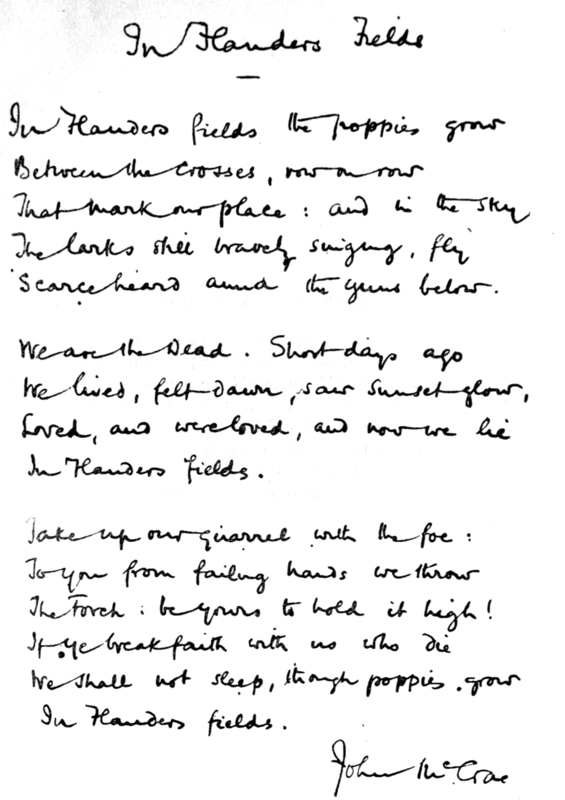 Helmer's burial inspired McCrae to write the above poem, composed on an ambulance near an advance dressing post at Essex Farm, Ypres, Belgium. McCrae's poem was published in an American magazine "The Ladies Home Journal" in 1918, and read by a teacher, Moina Belle Michael, who did voluntary work for the YMCA Overseas War Secretaries' headquarters in New York. Moina embraced the poem as a spiritual experience and realised she now had a new mission in life - the poppy flower was to be "her spirit child" ! She published her own poem "We Shall Keep Faith" as an answer to McCrae's poem. At the 25th Conference of the Overseas YMCA War Secretaries, three men attending the conference arrived at Moina's desk. On behalf of the delegates they asked her to accept a cheque for 10 dollars, in appreciation of the effort she had made to brighten up the Headquarters with flowers at her own expense. She was touched by the gesture and replied that she would buy twenty-five red poppies with the money. She showed them the illustration for John McCrae's poem “In Flanders Fields” in the Ladies Home Journal, together with her response to it “We Shall Keep the Faith”. The delegates took both poems back into the Conference. After searching the shops for some time that day Moina found one large and twenty-four small artificial red silk poppies in Wanamaker's department store. When she returned to duty at the YMCA Headquarters later that evening the delegates from the Conference crowded round her asking for poppies to wear. Keeping one poppy for her coat collar (vowing to permanently wear a memorial poppy) she gave the remainder to the enthusiastic delegates. According to Moina, this was the first group-effort asking for poppies to wear in memory of “all who died in Flanders Fields”. Since this group had given her the money with which to buy them, she considered that she made the first sale of the Flanders Fields Memorial Poppy on 9th November 1918. In this small way, a mighty tradition was born ! At the University of Georgia, Moina taught a class of disabled veterans. Realizing how much support such men needed, she came up with the idea of selling artificial poppies to raise funds for America’s disabled veterans. Her organizational ability soon was clear, as millions of people bought paper or silk poppies to wear as lapel pins on national days of remembrance. Women both made and sold them, and the endeavor raised so much money that the American Legion adopted the poppy as its symbol and honored Moina Michael with its highest award. A French woman by the name of Madame Maria Anna E Guérin was present at the 29th September National American Legion convention. Anna was a representative of the French YMCA Secretariat. She was inspired by Moina Michael's idea of the poppy as a memorial flower and she also believed that the scope of the Memorial Poppy could be expanded to help the needy. She considered that artificial poppies could be made and sold as a way of raising money for the benefit of the French people, especially the orphaned children, who were suffering as a result of the war. Anna Guérin returned to France after the convention. She was the founder of the “American and French Children's League” through which she organized French women, children and war veterans to make artificial poppies out of cloth. Her intention was that these poppies would be sold and the proceeds could be used to help fund the restoration of the war-torn regions of France. In 1921 Anna Guérin sent some French women to London to sell their artificial red poppies. This was the first introduction to the British people of Moina Michael's idea of the Memorial Poppy. Madame Guérin went in person to visit Field Marshal Earl Douglas Haig, founder and President of The British Legion. She persuaded him to adopt the Flanders Poppy as an emblem for The Legion. This was formalized in the autumn of 1921. "Madame Guérin : WHO PUT THE POPPY ON YOUR LAPEL ?" The first British Poppy Day Appeal was launched in 1921, in the run up to 11th November 1921. Nine million poppies were ordered, each with a metal pin and an accompanying leaflet with a reprinted McCrae's poem ! It was the third anniversary of the Armistice to end the Great War. Proceeds from the sale of artificial French-made poppies were given to ex-servicemen in need of welfare and financial support. £106,000 was raised (£4.5 million today's equivalent). Its success delighted the British Legion, and for 1922, they ordered 30 million poppies - this time to be made by wounded British soldiers of the Disabled Society. Since 1922,The Poppy Factory (originally called the Disabled Society) has been employing wounded, sick and injured ex-Service personnel in its Factory. 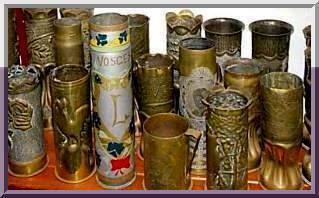 Major George Howson MC, who served on the Western Front, set up ‘The Disabled Society’ in 1922 in the Old Kent Road with the sole purpose of producing poppies, with the workforce being severely wounded veterans from WW1. In 1925, The Poppy Factory moved to Richmond, Surrey. Later, the Lady Haig Poppy Factory in Edinburgh was established. Both sites continue to make poppies, remembrance crosses, sprays and wreaths for The Royal British Legion’s Poppy Appeal. WHITE POPPY: The "Peace Poppy" was first produced in 1933 and the Peace Pledge Union (PPU) still distributes them to this day. Stridently anti-war, the aims of wearing a White Poppy were to remember both the military and civilian dead, to stand up for peace, and to challenge militarism. BLACK POPPY ROSE: Launched in 2010 as a way to specifically commemorate the contribution of black communities to the war effort, and to world history. SHAMROCK POPPY PIN: Commissioned by the Irish Branch of the Royal British Legion to commemorate the war's centenary and the Irish war dead; with Ireland still ruled by Britain during World War One, thousands of Irish soldiers died while serving in its army's ranks. PURPLE POPPY: Introduced by Animal Aid in 2006 to remember animal deaths at war, there was controversy over the use of the poppy flower to commemorate animals as "war heroes" and this led to the eventual replacement of the symbol by a "Purple Paw". "POPPIES - BLOOD SWEPT LANDS AND SEAS OF RED"
My own ceramic poppy (from the Tower of London display), with two Trench Art shellcases and "Lest We Forget" memory in Hambleton, Lancashire, on 8 January 2015.